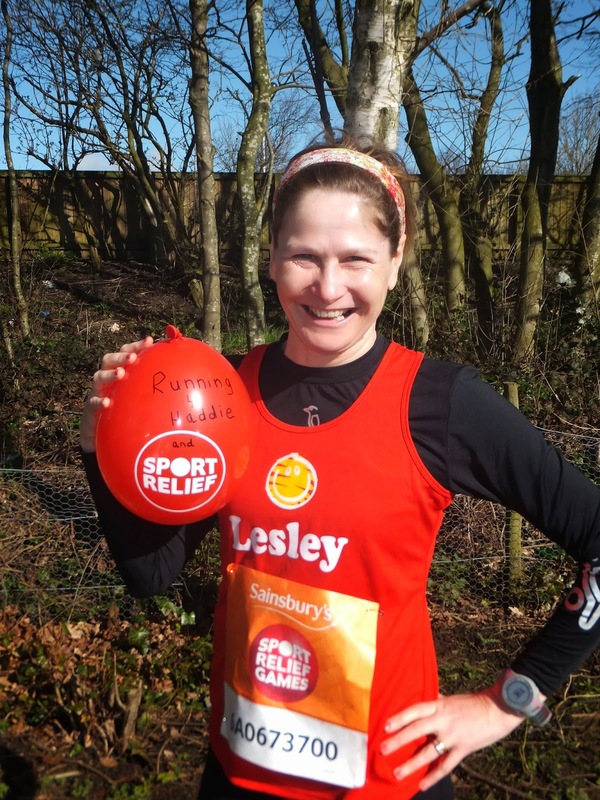 Today, Sunday 23rd March 2014 I ran in The Lancaster and Morecambe Sport Relief 6 mile run. The run was due to start at 10.45am with a warm-up at 10.30am. When I woke up this morning I had somehow developed a heavy cold overnight and I felt lousy. I lay in bed contemplating whether I was actually going to bother getting up and going but then convinced myself I might as well as it was just a fun run with no pressure! I had a bowl of porridge and coffee and was soon feeling a little brighter - and the sun was shining! 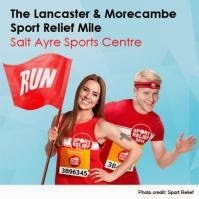 We left our home in Kendal at around 9:30am for the 30 mile journey to Salt Ayre Leisure Centre which is situated half way between Lancaster and Morecambe where the race HQ was situated. Traffic flowed nicely and we got parked really easily in the leisure centre car park arriving just after 10am for the 10.30am warm-up! Although I already had my race number I still needed to register to say I had turned up! After registering and visiting the loo I took residency in the track club house to try and keep warm! Although it was a lovely sunny morning it was still incredibly cold and windy! Thankfully I had dressed in long running pants, a long sleeved base layer with a vest on top and gloves! Despite it being a National charity event I was amazed at how few runners it had attracted despite it only being £3 to enter! At 10:30am prompt we were all summoned to a central point where a man fancying himself as Mr Motivator took us through a warm-up and stretch routine. There were 3 runs taking place at the same time - a 1 mile, a 3 mile and a 6 mile run basically all running the same route just a different number of times! The 1 mile group ran one and a bit times around a set course where as we ran 7 and a bit times round the same course! I was dismayed when I discovered this was actually a lap run as I usually detest this sort of thing. The run advert said "Take in the stunning views of the River Lune and the Historic City of Lancaster" so I wrongly assumed it would be a fairly interesting route! Instead it was laps of a cycle track which gave us a 100m stretch along the river with the city in the background! However, since I was there I thought I might as well make the most out of a bad situation and decided to try and use the laps to regulate my pace and see how much I could push myself for future 10K runs without expiring! Once we had warmed up the 1 mile group were led off to the start point, then the 3 mile group then finally the 6 mile group. Despite it being poorly attended there was still a fair amount of spectators giving support. We were soon on our way and 7 laps loomed large! However, once I got going and I got my head round doing laps I thoroughly enjoyed the run and liked the no pressure aspect that the "serious" races have! During the first couple of miles there was lots of little toddlers and children taking part in the 1 mile event which made me smile to see them having fun running and also a fair few wheelchair participants who were being pushed by runners! Hats off to the runners I wouldn't fancy running with a wheelchair for 6 miles! I completed the first mile in an 8:11 minute mile and vowed to try and maintain this pace throughout if possible. The 2nd mile was slightly slower at 8:15, then 8:22, 8:23, 8:28 and the last mile was also 8:28 giving me a finish time for the 6 miles of 49 minutes 13 seconds working out as an average 8:20 minute mile pace! I was disappointed that this wasn't in fact a 10K race as I would have got a PB by a couple minutes at around 51:46! Anyhow, as this was my first 6 mile race I still got a PB! 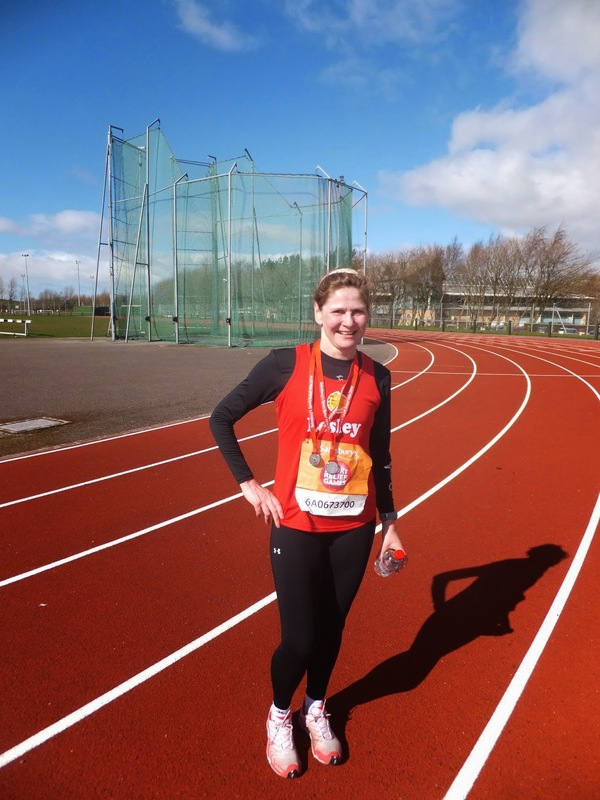 I was still chuffed to bits with my achievement and was one of the first of the 6 milers to finish! On finishing I got a bottle of water and 2 medals! One for myself and one for my running buddy Haddie! All in all a really enjoyable experience and it goes to show just relaxing and running as your body dictates really works! I would never have dared push like I did today in a "proper" race in case I couldn't finish but today I didn't feel it mattered if that happened! You can view the run here!